Sorry... the 2017 Mitsubishi Mirage is no longer being sold as new. Instead, take the first step to a great deal on 2019 Mitsubishi Mirage with a free price quote! 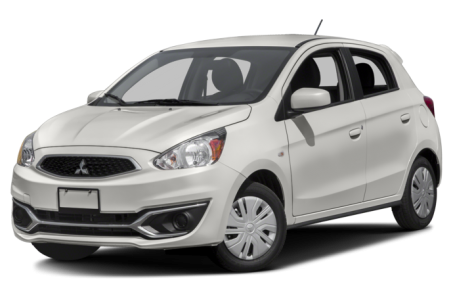 The 2017 Mitsubishi Mirage is a subcompact 5-door hatchback that competes with the Ford Fiesta, Nissan Versa Note, and Chevrolet Spark. It has been restyled after skipping the 2016 model year. The new, 4-door Mirage G4 sedan will be covered in a separate overview. Three trims are available: the ES, SE, and GT. Overall, the 5-door Mirage has a nimble, smiley appearance. Both the headlights and lower fascia are sharply cornered for a bit of an edgy look. Chrome accents at the grille and bottom air vents help add visual interest. In contrast to the front, the rear-end motifs are more rounded. Standard features include power side mirrors, a rear spoiler, and 14-inch wheels. Bi-xenon HID headlights, LED daytime running lights, front fog lights, turn signal indicators at the side mirrors, and larger 15-inch alloy wheels are optional. Under the hood, the Mirage is a powered by a standard 78-hp, 1.2-liter 3-cylinder mated to a 5-speed manual transmission or a continuously variable transmission (CVT). Fuel economy for the Mirage is an EPA-estimated 37/43 mpg city/highway. Inside, the Mirage features a standard cloth interior with a 60/40-split folding rear seat. It has 47 cubic feet of cargo space with the rear seat folded down. The center stack features a standard audio system that includes CD/MP3 playback and a USB port. It can be upgraded with a 6.5-inch display, Apple CarPlay/Android Auto compatibility, Bluetooth connectivity for phone and audio, and Rockford-Fosgate audio system. Standard features include air conditioning, power windows/locks, tilt steering wheel, and remote keyless entry. Available features include automatic climate control, power/heated front seats, push-button start, and a leather-wrapped steering wheel. Standard safety features include front airbags, antilock brakes, an electronic stability system, and a tire pressure monitoring system. Available features include a backup camera and hill start assist. 27 of 28 (96%) consumers said they would recommend this vehicle to a friend.